Eloise had assumed Mrs. Rivard would be gone by mid-year. She seemed so frail … so quiet. The only time she’d perk up a little would be when that sweet nephew of hers would come by for a visit. Unfortunately, Nephew’s wife frequently tagged along. Mrs. R and Eloise would exchange knowing glances as Missy prattled on about parties and dresses and (her favorite topic) decorating. Missy would usually have a trendy tote bag in hand (one of those with polka dots, fur, and feathers, the kind that made Mrs. R wrinkle her nose in distaste). It would be overflowing with the latest decorating magazines. Eloise knew, of course, that Mrs. R had deeded the house to Nephew. Fortunately, a lifetime dowry clause insured that he and Missy couldn’t take possession as long as Mrs. R lived in the house. There was irony in Eloise thinking of Mrs. Rivard as ‘old girl.’ Eloise was actually a few years older and had worked for Mrs. Rivard’s mother. When Mrs. R’s father had the new house built for his daughter as a wedding present, Eloise was “transferred” and went to work full-time for the attractive young couple. Mrs. R’s amazing recovery seemed to have begun with a phone call a few days earlier. Eloise overheard her talking and laughing, ending the call with “Friday night would be perfect, Ted. See you at seven!” She called out for Eloise to come to the bedroom. Eloise hesitated a few seconds and then walked slowly into the room (to avoid the impression she’d been eavesdropping just a few feet away). “Did you know Dr. Wentworth is back in Natchez for a visit, Eloise?” Yes, ma’am, I believe I did hear that.” There was little Eloise didn’t know that went on in this town. What she didn’t see or hear directly, she’d learn during nightly phone calls from her cousin, Tressie. Eloise knew that Dr. Wentworth’s wife had died the previous year, and he’d sold the family home. He’d gone to live with his unmarried sister in Houston, unable to bear the thought of being alone in his big, empty house. The Wentworths and Rivards had been great friends for decades. The wives were in the same bridge club; the men played golf together at least once a week. The two couples had vacationed together and been frequent dinner guests in each other’s homes. “Set a table for two in the den, Eloise. I think it might be nice to be near the fireplace, in case it’s cool tonight.” Eloise laughed softly to herself “she’ll make sure it’s a cool evening. She’ll have that air conditioner blasting while the fire’s going. It’s not like she has to worry about how she’ll pay the utility bill!” Eloise had seen her do it before in years past, setting the stage for a romantic evening. “Use the wedding china, Eloise.” “And which wedding china would that be?” Eloise had never known anybody who loved dishes as much as her employer. She’d picked multiple patterns as a bride and had so many teas and showers given in her honor that she ended up with three full services for twelve! Dinner was ready. Eloise had ended up mixing three Haviland patterns on the table (the way Mrs. R used to do before she stopped entertaining and took to her bed). She decided she liked the effect. Mrs. Rivard had told Eloise she wouldn’t need to stay. She said she’d stack the dishes in the sink for Eloise to deal with the following morning. It was two minutes before seven when Mrs. Rivard slowly descended the stairs. Something about the way she looked brought tears to Eloise’s eyes. In the simple blue dress, with her halo of pale reddish-golden hair, perfect make-up, and the diamond earrings and bracelet Mr. Rivard had given her, she looked the way she had forty years earlier. She even appeared taller. If you'd like to see the post where readers of Affordable Accoutrements first met Mrs. Rivard, click HERE. I'm posting early this week, because I'll be out of town for a few days attending a conference. 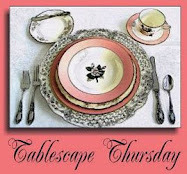 I'll attempt to link to Tablescape Thursday with Susan of Between Naps on The Porch. I hope you liked my little story and Mrs Rivard's romantic table for two. Fantastic, Incredible, Beautiful, Wonderful, Great, etc etc etc..... all the adjectives you can think of !!! , I love it, the table, the cloth, the napkins and rings, cutlery ( flatware), glassware, , the table arrangement, the room, the lighting and the story well.......... I certainly want to be there and not here, so romantic. Jackie in UK. I throughly enjoyed reading Mr. R. Your photos are incredible and I love every detail of your tablscapes! 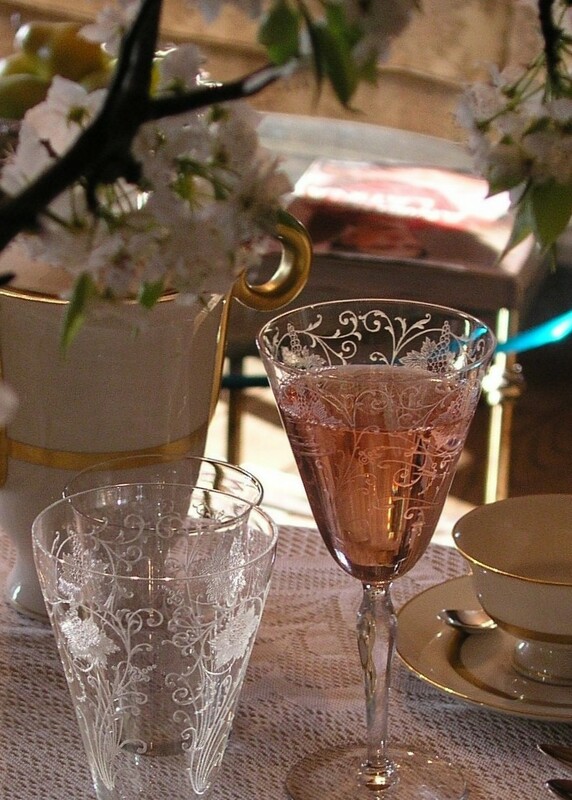 The crystal glasses are just beautiful and I do have to also mention the blossoms in the vase. So beautiful! I really loved this post... I lingered for quite a while! Oh Bill - the BEST post I have ever read. Hi Bill! Another pretty table! Have a safe trip. with pink or blue hair! Loved it Bill! Love Mrs. Rivard and wish the best for her and hope to continue hearing many more tales of this budding romance. Thank you for that delightful story with the glamourful photos. I especially like the crystal and the flowering branches of your neighbor's tree. Oh, I was transfixed by the story of Mrs. R. and I have to go back to the beginning. Your table is stunning as always. My favorite photo is outside of the french doors in the evening. And the blossoms...gorgeous! It's a lovely story and a beautiful table (as always) -- you're tables are so elegant! That's what I like best about them! Ooooh, a gentleman caller. That certainly got her moving. I love the "fire" in the fireplace Bill. Nice touch. Your painting over the fireplace is so gorgeous. Those rich colors. Love it. My heart is skipping a beat! I can't decide whether I like the Ladore or the Fostoria better. Thankfully I don't have to choose. Just stunning. Have a happy and blessed Easter. Enjoy your time away. I so enjoyed this post! It is one of the most beautiful posts I ever saw in blogger land! I enjoyed your story, the gorgeous tablescape and I loved the pictures of the beautiful paneled fire place! You gave me so much inspiration! Oh my, Bill, your table is exquisite!!! It's one of your best... The flowering branches are the perfect touch for your table (what a wonderful neighbor!). 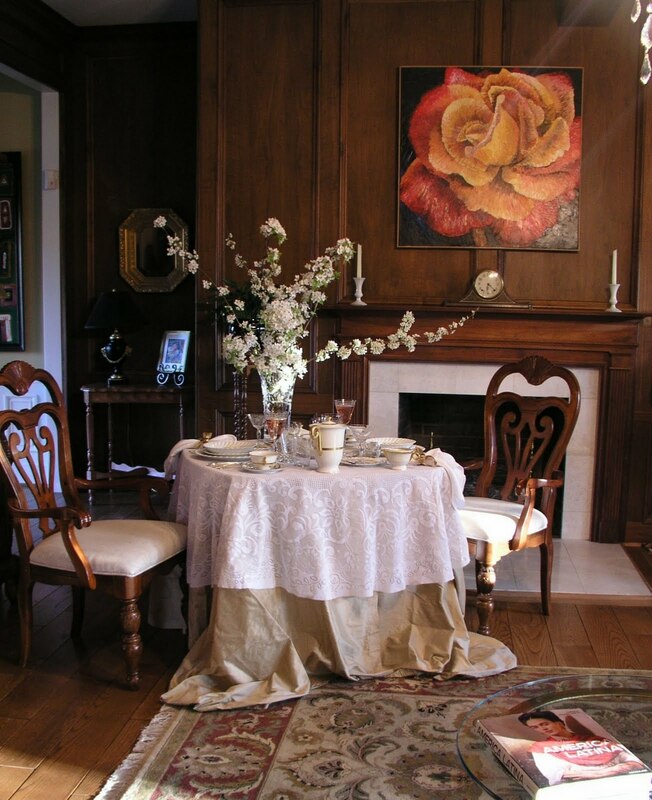 But as beautiful as the table setting is, the story of Mrs. Rivard is captivating. She is becoming a favorite character. What a gorgeous romantic table! What a story! The room is just beautiful. I appreciate your comments on my Bridal Coffee post. Bill, I loved the story about Mrs. R. The table setting enhanced the story, or the story enhance the table setting. Either way, it is wonderfully told through words and pictures. This was absolutely enjoyable to read this Sunday afternoon! What FUN!! Such a romantic & mysterious story, set in an extraordinary room. I was expecting to actually SEE Mrs. Rivard in her pretty blue dress any minute. The Havilind china is so very pretty with the gold banding & the scalloped edges. It looks somewhat familiar to me...wonder if someone in our family had something similar???? This tablescape is in a class all by itself, Bill. The china is beautiful, and the glasses are my favorite, all that etching. And I sure hope your neighbor doesn't see this , she'll know for sure why her tree looks a bit uneven! Have a great week! And if I don't see you before..have a blessed Easter! I'll make an egg for you! Bill, it's good to get an update on Mrs. R. Your posts are so entertaining. :-) I love the intimate setting of the paneled library, and your selection of china and crystal is the perfect choice. Love how the graceful lines of the china, the etching of the crystal, the lace cloth, and the wispy branches of white blooms all play off of each other. You do know how to set a romantic table! Bill, I'm new on posting on blogs, so here goes. I must be on the lookout for some china like that! Love the crystal and elegant southern story. It is right down my southern alley. Thanks for sharing such a delightful blog with us. Oh my goodness, this might be one of the most beautiful table settings that I have ever seen... The china service is so pretty (love the scalloped edges) and the flatware is gorgeous (it certainly looks like sterling; plus, that is so special that it was your Mother's). 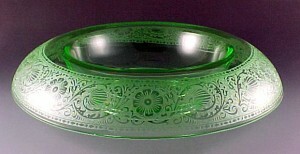 BUT, those crystal glasses: oh my, to have such a full set as this, so many different sizes, it is truly FABULOUS. They are just gorgeous. They remind me a little of a set my mother had when I was little and she entertained... but I only have about 2 glasses left, the rest were broken over the years. So you are so lucky to have so many pieces! And I noticed from your picture taken from outside: I LOVE your bar (and barstools!) in the corner! Another lovely home item that I remember from when I was little (my uncle had a bar and it seemed so upscale to me!). I wish I had one and I wish more people had them. Again, you are so lucky. Well, I've run on too long. Thanks for sharing - I thoroughly enjoyed it - truly gorgeous!!! Oh my.......I savored every morsel from the story and the tablescape and am waiting with baited breath for more. You completely entrance your followers with a beautiful table week after week. Everything is just breathtaking. I always look forward to your post. I enjoyed reading about the story as well as the tablescape. It is always a treat to visit your post. Bill, you are amazing! Not only is your tablescape gorgeous, your Mrs. R stories are fabulous! Bill, this is story is delightful! I thoroughly enjoyed it. You had me hanging on every word, and so did your tablescape. Lovely! I've been MIA and will be for another few weeks. Sigh. Hopefully, all will be well soon. After all, things went well for Mrs. Rivard, so there's hope for all of us, too. LOL! I absolutley LOVE your stemware! Gorgeous setting...love the evening photo from outside looking in! Love your second chapter with Mrs. Rivard! What a sweet story of romance. Hope your have a wonderful trip and when you return....please give Mrs. Rivard my best regards. Such fun!! I love the story with the beautiful table. Bill, The story is delightful and the table is gorgeous! The crystal is amazing. Love the china too. The silver is beautiful too; how fortunate you are to have this family heirloom. I really like how you took a photo from the outside looking in, and love your den and the fire. This is a fabulous tablescape accompanied by a great story - it was fun to read! It was nice to meet Mrs. R & see such a Breath-taking, exquisite tablescape! The shot through the window is priceless. Safe travels. Bill...this is sooo gorgeous! I love the story! The curtains as a tablecloth is a great idea...looks so elegant. I adore that china pattern...so stunning! Your lighting is so romantic and wonderful...just beautiful! Some day (probably soon) these blogs of yours will be studied by PhD candidates as examples of the Southern sensibility. Their findings, published after years of research, will indicate that the main ingredient is Charm. I think you really need to give up your job now and start styling full time. should be a stylist on a movie set. Happy Easter my gorgeous friend. Thank you, Bill, for the chuckles and your gorgeous table. Have a successful trip. I love the intimacy of small table settings. The whole thing is beautiful, as always. Lovely story and tablescape. Love the flow of the tablecloth...as usual great job! Elegant! Lovely. And the story was touching, too. Bill, you've done it again! Your story is lovely and the photos beautifully illustrate the story. I have fallen in love with Mrs. Rivard and Eloise and can't wait for another installment. As always your table is beautiful and I love the way the light captures the glow of candlelight, the whiteness of the flowers and cloth and the intricate etching on the crystal. A delightful short story to go with my afternoon cup of tea, and glorious photo's of a wonderful table set for a romantic dinner a deux. What a wonderful story Bill. It put a smile on my face. I'll have to go back and read more on Eloise and Mrs Rivard. As for the table setting and room, everything is spectacular. I am a big fan of dressing up for a beautiful table. I can't see myself wearing anything other than my favorite suit or tuxedo. A 5 star setting for sure. As always, thanks for the eye candy and inspiration. Have a safe trip. Just incredible. Every piece is a delight and every picture is beautiful. Thanks so much for your posting, the table, the story...it made my evening, really. Bill, you have outdone yourself this week! That is a truly amazing tablesetting for two. I find myself right there in the house watching the story unfold as I look at your remarkable pictures. You have such a talent for storytelling, photography and of course tablescapes. Thanks so much. It's like I just watched a good movie. I cannot wait for more!!! loved the dishes, loved the crystal, loved the story. Now gatta go and read more about Mrs. Rivard. Oh, Bill, this one stole my little, old heart. Mrs. Rivard is the quintessential Southern lady, and I hope you will make her and her adventures a recurring event. I want to know more about her! The tablescape just speaks to me--I was breathless and having palpitations when I saw the graceful white blossoms, the white draped cloths, the intricate stemware, the gorgeous panels, and the fireplace. I am in the middle of chaos (I always am; it's normal--but this time it's particularly bad) with my dish debacle (shouldn't have tried to make a room for my obsession). So visiting you is a balm for my soul. I would have been by earlier, but my laptop kept shutting off and on of its own accord. It just won't boot unless it's good and ready. Bandwidth is transferring all of my documents and photographs to an external HD...but it looks like my old Hewlett Packard has taken to its death bed. What a great story! I will have to go back and read more of Mrs. Rivard's adventures. And the table is beautiful. I was especially happy to see the flowers, they look like the branches on my plum tree. This is just such a fabulously interesting and spellbinding tale with regard to how well written the prose are Bill! That dear old Southern, grande dame who has become elderly and frail, is someone I need to read more about with your masterful juxtaposition of contrasting characters in the writng of this riveting piece! Ooh my, the spectacular and singularly lovely setting; why it could not be more enchancing to your tale than it clearly is!~ The 'light as Spring' breezes, the 'billowly white puffs' of Spring blossoms and that quintessentially Southern paneled library of yours; the china, the artistically magnifiscent draping of the table cloth, the subtlety and nuance of the ephemeral lighting, even the eloequently beribboned napkin, all so eloguently speak of the quintessential Southern gentleman that you undoubtedly are Bill! 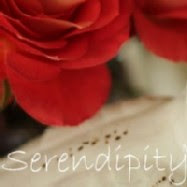 What pure delight to have discovered your, 'second to none', blog a relatively short while ago! I absolutely need to read more of your fabulous writings Bill!~ 'When will your book be published'?~ I can hardly wait until next time that you decide to share more of Mrs. Riverts, Southern lady adventures and missives! Your breathtaking tablescapes are forever, 'etched in my mind', as being nothing short of perfection Bill! You are most warmly invited, when you get the opportunity, to once more also visit my blog, where you will find that this week's tablescape creation has a decidely, whimsical 'flavour'. You see I have been 'playing with' the hues of the season, as well as with my jewelry display mannequins creations.~ A Decidedly sugary, 'sacharin', feminine experieince, yet intended as an expression of 'light heartedness'; (not, 'heaven forbid', like the pink faux fur trimmed, 'kitch-esque purse', that so aptly you descrided).., 'Teetering on the edge' albeit..,('wink'), yet all in good fun Bill! Wow. Just wow! What a great story! LOVE that crystal -- simply gorgeous. And your mother's silver is also lovely! Love the story line. You should give your blog soap opera a name. Give Eloise a raise if she stands her ground about no paint on the paneled walls. I was delighted to see Mrs. Rivard is back! That crystal is my very favorite! Love, love, love it!! The nighttime shots are gorgeous! Beautiful 'Mrs. Rivard' table...the china is stunning. WELL.!! I THOUGHT I had been *blown out of the water* by your beautiful tables, dishes and stories. But, my friend, Bill...this is absolutely STUNNING ! Your subjects...your lighting, your photos are just magnificent. What a romantic you are!! I enjoyed every single picture and word. Thanks so much for going to all this to please your readers. And, Indeed, you DID please us. Too, too fabulous for words. That china is to die for. Thank you for a wonderful table and story! I am stunned into silence and people who know me would say you deserve the Nobel Prize for that alone:) I can add nothing to what has been said except- please keep the phone line clear so all the major decor magazines can get through to you..
Delightful story and lovely table setting. I so look forward to seeing your name because I know there is going to be something charming and beautiful to behold. Keep up the good work!! You really have an eye for detail. Bill- I saw this post earlier and did not have time to comment, but I just had to come back to tell you how much I love it. I still remember when we first met Mrs. Rivard :) I do believe you must have spent some time in Natchez :) I am glad the "old girl" is perking up...We can't have that tacky Missy getting her hands on that library paneling! Lovely! I truly felt as if I were there and I'd love to hear a continuation of this story! Glorious styling as always and I love the different light/dark contrasts in your photos! Bill, I enjoyed The story and the gossip! You just have to love Mississippi! lol The room is wonderful! The setting is so lovely! The china, the Tea Set! Oh,I do love the flowing branches,and tablecloth! How beautiful the China is! Such a lovely Southern Tea Setting! Since your out of town I hope you do not mind, I so want to link this on Tea Time Tuesday! For it is just lovely! Hope your having fun out town, I sure your at an Estate Sale buying some lovely China! You are just so fun! I love it all! Bill...I didn't know about Mrs. R but will enjoy getting to know her. Sounds like many Southern ladies of my childhood! The table is a wonderful scene to follow as we read about dear Mrs. R. Your collection of crystal and china is a treasure. Thanks for sharing! Hi Dear Bill! What a story telling you are. This was a wonderful story. Now about your glorious table! Words fail me. It's so beautiful as well as getting another glimpse into your lovely home! Oh, I'm a new grandmother now and it's wonderful! Maybe I should put down Jane Austen's Persuasion and trade her Captain Wentworth for your Dr. Wentworth! Can't wait for the next chapter. Oh, and the tablescape is absolutely stunning in your paneled room. Stay safe during your trip! awesome story Bill..........and once again such a beautiful table..............no words at all!!! Your house is just lovely! I think the whole thing is worth a book. Call it the Rivard Chronicle and don't let anyone talk you into doing it without your photos. And consider the era evoked! Hope you have a good trip and a Happy Easter. Please stop by and see us when you have time. -- Jane F.
What an elegant table...so beautiful!!! This is my first time visiting your blog...I am very new to all of this. :) I can't wait to continue clicking to see what else you have posted. I see you have quite a following. Well, I damn near expected Mrs. Rivard to jump right out of the computer! Had me enthralled the entire time. Lovely job. Jackie OH, and the table looked great too! You totally captivated me with your post. Seeing the romantic setting for two and living it in Mrs. Rivard's story was so beautifully done. The room in the background definitely set the stage. I want to go shopping with you at the local shops and estate sales where you found that gorgeous Fostoria crystal and Haviland china. What finds! Of course the flatware that was your Mother's always holds a key to my heart. Oh...I'm going to see if any of my neighbors have flowering branches, they are beautiful. Thank you for sharing your entertaining post. Wow! What a great blog! I will definitely follow it! Love the story, containing as it does hope for all old gals. Love, love, love the Fostoria Woodland. Hope the conference exceeds your expectations. Thanks for sharing this with me today. I see you are also a talentedd writer!